Pittwater spending on car-parks – the greatest misallocation of resources? 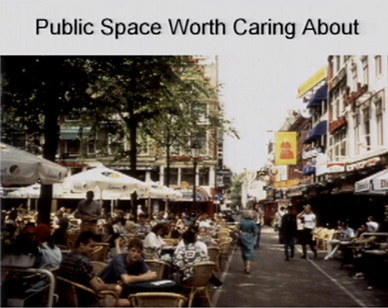 We need to design public spaces worth caring about. A couple of posts ago we looked at Melbourne and how it did simple re-designs to create public spaces worth caring about. I’m concerned that Pittwater Council should be focusing more on the design of our villages, rather than the craft fairs, to Enliven Pittwater. Read these extracts and watch the video below on “The ghastly tragedy of our suburbs”. Think about Avalon, Newport and Mona Vale, especially when watching the video. Think of how the new Bungan Street car-park will make it almost impossible to walk into some shops, think of the failure of our public spaces such as Dunbar Park, Mona Vale Park, the lane ways and of how you walk around our villages. Now think of villages you have been to that you love, that you want to go back too. How can we incorporate the aspects of the villages that you love into our villages in Pittwater? Tell Enliven Pittwater. This is a good public space. It’s a place worth caring about. It’s well defined. It is emphatically an outdoor public room. It has something that is terribly important — it has what’s called an active and permeable membrane around the edge. That’s a fancy way of saying it’s got shops, bars, bistros, destinations — things go in and out of it. It’s permeable. The beer goes in and out, the waitresses go in and out, and that activates the centre of this place and makes it a place that people want to hang out in. You know, in these places in other cultures, people just go there voluntarily because they like them. We don’t have to have a craft fair here to get people to come here. (Laughter) You know, you don’t have to have a Kwanzaa festival. People just go because it’s pleasurable to be there. But this is how we do it in the United States (and Australia). 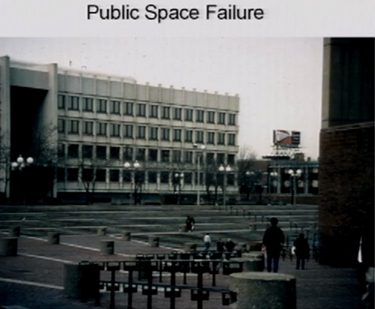 Probably the most significant public space failure in America, designed by the leading architects of the day, Harry Cobb and I.M. Pei: Boston City Hall Plaza. A public place so dismal that the winos don’t even want to go there. (Laughter) And we can’t fix it because I.M. Pei’s still alive, and every year Harvard and M.I.T. have a joint committee to repair it. And every year they fail to because they don’t want to hurt I.M. Pei’s feelings. We’ve got a lot of work to do. We’re not going to be rescued by the hyper-car; we’re not going to be rescued by alternative fuels. No amount or combination of alternative fuels is going to allow us to continue running what we’re running, the way we’re running it. We’re going to have to do everything very differently. And America’s (and Australia’s) not prepared. We are sleepwalking into the future. We’re not ready for what’s coming at us. So I urge you all to do what you can. Life in the mid-21st century is going to be about living locally. Be prepared to be good neighbours. Be prepared to find vocations that make you useful to your neighbours and to your fellow citizens.